Welcome to my first Christmas Gift Guide of 2018, which is for the babies in your life. Personally, I've always found shopping for baby gifts quite a challenge because the things they need at that age are limited some what. I therefore tend to focus on giving gifts that will either help to capture those precious early years, are practical or can be enjoyed for many years to come. The first year or so of a child's life is filled with magical milestones, exciting changes and all the growing, making it such a special time to shop for gifts. 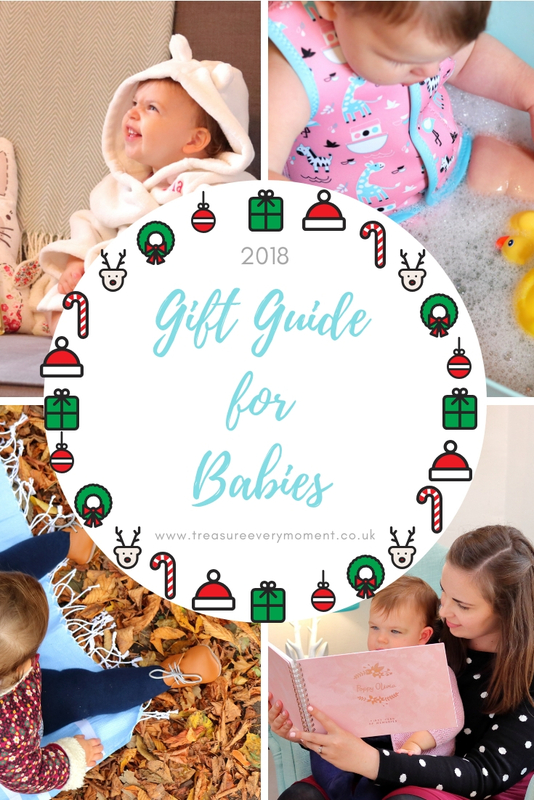 All of the gifts I've included in this Gift Guide would also make thoughtful presents for baby showers, first birthdays or christenings too. Large Personalised Floral Wooden Keepsake Box (£19.99) from Born Gifted - As soon as you become a parent you will probably find that even the smallest little thing suddenly has so much meaning and sentiment behind it. Keeping all of these sentimental pieces safely can be a challenge, which is why giving a keepsake box is such a special gift for a baby. It's somewhere their parents can store all their precious belongings, such as hospital bands, pregnancy scans, photographs, special gifts, birth certificate etc. This Floral Wooden Keepsake Box from Born Gifted is not only really spacious, but can be personalised with whatever you like making it perfect for any occasion. The extra details, such as the natural wood and clasp closure make this keepsake box a beautiful addition to any room. Muslin Squares - Set of 3 (£15) from Mama Designs - Muslin squares are every parents absolute essential item when it comes to life with a baby. Their list of uses is almost endless, which is why you'll find them in almost every room of our home. As they have to be everywhere you may as well have beautiful ones, such as this Monochrome Pineapple set from Mama Designs. It is one of their classic designs, which is also throughout their range of cosy sleeping bags. In the set of three muslin squares you get one plain and two with the pineapple design on and they are incredibly soft. If you like to buy the 'baby essentials' in a more stylish alternative, then you should also have a look at the Mama Designs Cellular Blanket range, which is filled with greys mixed with bright colours and are available in a range of designs. Personalised Foiled Baby's First Year Memory Book Floral (from £28) from norma&dorothy - It's so rare nowadays that photographs are printed out and kept in photo albums, which seems such a shame when we are all taking more photographs than ever before. Taking the time to put together a memory book for your child's first year gives them something that they can look back on in years to come. Filling it with holidays, special occasions, memories, photographs, leaflets, first curl etc. means that not only do they have those moments captured forever, but so do you. The quality and design of this Floral Memory Book from norma&dorothy is simply stunning, with its hard front/back covers, 80 pages and bronze wiring. You can choose from A4 or A5, Gold/Rose Gold/Silver foiling and Blue, Grey, Light Stone, Mint, Pink, White for the book colour. All norma&dorothy products come beautifully wrapped in white and gold flecked tissue paper, making gift giving that bit easier and extra special. Knitted Hedgehog Cushion (£26) from Sophie Allport - When it comes to preparing for a baby to move into their own room one of the best parts has to be sourcing beautiful yet fun accessories for their nursery. Accessories that will appeal to them, create a comforting bedroom environment and look nice too. Sophie Allport has an absolutely stunning range of homeware, accessories and gifts for the whole home, but especially children's bedrooms. This Knitted Hedgehog Cushion is a fun addition to a feeding chair or reading area, with its rosy pink cheeks and bright orange nose. Each cushion is also skilfully hand finished and made from 100% cotton. Baby Bedtime Set (£13) from Childs Farm - Those calming moments before the end of the day when it's bath time are some of the most precious and important. Babies love splashing around the bath, so using baby friendly products is really important. Childs Farm's range has been specially developed to care for your baby's delicate skin, whilst still being moisturising. 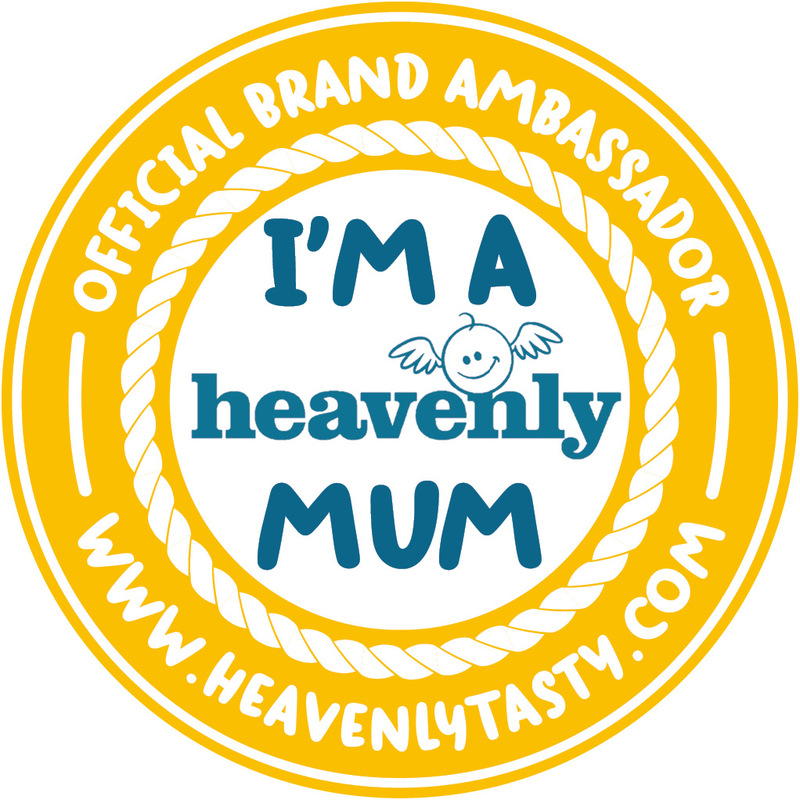 All of their products are made with organic essential oils, never tested on animals, suitable from newborns, contain naturally derived ingredients and suitable for sensitive/eczema prone skin. Their Baby Bedtime Set contain three 250ml products, including Baby Bedtime Bubbles, Baby Wash and Baby Moisturiser. Everything your baby will need to look after their precious skin. Luxury Grey Knitted Zebra Baby Blanket (£30) from Nuby - Baby blankets are another item that is so versatile in those first few years, but are also such beautiful gifts to give. This Zebra Blanket from Nuby is such high quality, incredibly cosy and comes in a variety of designs including a Fox, Llamas and Rocking Horses. They are all made with 100% super soft cotton and are a generous size at 87 x 105cm. It keeps our little ones cosy while in the pushchair or cot, as well as being a good picnic blanket or for snuggling up during those colder months. Baby Oil (£3.99) and Bottom Butter Nappy Cream (£3.75) from Palmer's - Palmer's is perhaps best known for it's stretch mark range of skincare products, however they also have a nourishing range of baby care products that not only smell incredible but are filled with Cocoa Butter. 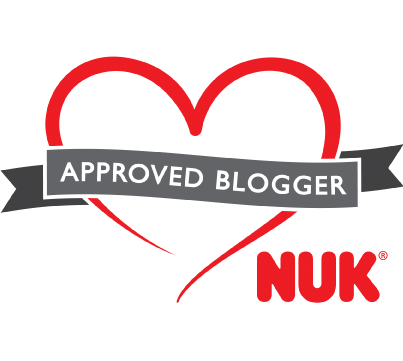 It is the key ingredient across most of their product range and you can see why when you start using their products on either your skin or your baby's skin. The Baby Oil is both light and moisturising, which makes it ideal for baby massage whether you go to a class or like to do it at home. The Bottom Butter not only has a brilliant name, but also provides a protective moisture-proof barrier that keeps wetness away from baby's skin while the Cocoa Butter soothes irritated skin and the starch acts as a drying agent. Personalised 'Big Adventures, Little Treats' Money Box (£12.95) from The Little Picture Company - When babies are born they may receive gifts of money from loved ones and what better place to keep these than in their own personalised money box? The Little Picture Company have a wide range of money boxes on their website, which suit all ages. This one can be personalised with the child's name, as well as four things that they may be saving for such as new toys, books or rainy days. You could also have it in your child's room for any of your spare change because after all, if you take care of the pennies then the pounds will take care of themselves. You can also choose between teal, mauve and blue for the colour banner and writing on the back. Derby Caramel (£25) from Inch Blue - The Heirloom Collection by Inch Blue is filled with beautifully timeless soft leather baby shoes that have that contemporary twist. Soft suede soles are ideal for pre and new walkers, due to their flexible and non-slip nature. Inch Blue hand make their whole range of shoes to order and that attention to detail can really be seen once you receive the shoes. The delicately embossed logo on the soles, the 100% wool felt lining and soft-breathable leather all make these shoes feel that extra bit special. Aside from the timeless Heirloom Collection Inch Blue have a vast range of leather shoes with fun designs, from animals to transport to dinosaurs and flowers. Something to match every outfit and all lovingly made here in the United Kingdom. Winter Sleeping Bag in Lovely Reverie Dandelion (£55) from aden + anais - How snuggly does this sleeping bag look? Aden + anais do the most cosy range of sleeping bags, especially in readiness for the winter months. This design of sleeping bag is available in five different patterns, including the night sky, stars and whales and are available in three sizes: 0-6 months, 6-18 months and 18-36 months. At 2.5 tog this is a sleeping bag that will keep your little one cosy during these colder months and the easy-dress poppers, double-direction zipper and additional popper under the arm make sure that it is easy to use too. A practical yet luxurious gift for any baby this Christmas that will certainly be loved and used. Dots and Rainbows Baby Microfiber Bundler (£35) from Hatley - During winter, whether it's rain or shine, we need to keep our little ones warm and this Bundler from Hatley makes doing just that so much easier. The fun dots and rainbow pattern, waterproof outer layer, polar fleece lining, attached hood, boot straps, machine washable and helpful full length zipper all work together to create an easy to use rain suit that won't only keep your child dry but also warm too. It's comfortable and cosy, which is perfectly in-between a single layer rain suit and snowsuit. This makes it versatile in a range of weathers and if you want it to fit for even longer then you can be generous when choosing the size because of the elastic sleeve and leg openings. The Bundler is available in the following sizes: 9-12 months, 12-18 months, 18-24 months and 2-3 years. You can also choose a variety of other Hatley outerwear pieces in the Dots and Rainbow pattern, including this matching Rain Jacket which is perfect for a bit of sibling twinning! Nina's Ark Happy Nappy and Baby Wrap Bundle (£28.79) from Splash About - Splash About are well known for their Happy Nappy, which has been specially designed to move with your baby for maximum protection from unwanted leaks. It is approved by swim teachers and leading swim schools, so a baby swimming essential. The Happy Nappy offers UPF 50+ sun protection, are long lasting and reusable, not to mention available in a range of fun designs and patterns. They are available in sizes 0-3 months, 3-6 months, 6-12 months, 12-24 months or 2-3 years. Splash About also have the Baby Wrap Wetsuit, which helps to keep your baby warmer for longer in the water and is really easy to change in and out of. It is made from premium super soft quality neoprene with UPF 50+ sun protection, which can be adjusted using the wide Velcro fastenings and can be opened to be completely flat. The neoprene is also nonslip, making it easier to hold your wriggling baby whilst in the water. It is available in sizes 0-6 months, 6-18 months or 18-30 months. Both the Happy Nappy and Baby Wrap are available to buy separately, but by buying this bundle you save over £3 and are completely equipped for taking babies/toddlers swimming. You can also pick up a hooded towel or poncho towel to match the Nina's Ark print. Penguin Soft Play Mat (£49.99) from Play&Go at 1TwoKids - Play&Go have an impressive range of practical play mats, all of which gather up to make tidying away and storing toys easier. Recently they expanded by adding an outdoor, mini and soft collection to their existing range. 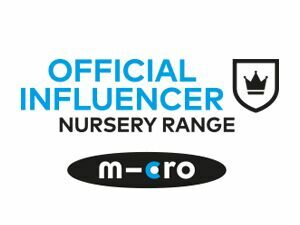 Their Soft Play Mats are especially designed for babies to enjoy tummy time on, playing and they are also easy to gather up and transport around. There is a detachable carry strap included, which can be used when taking the play mat on holiday, to see family/friends or out on coffee dates. The Soft Play Mats are available in four designs: Polar Bear, Llama, Peacock and Penguin (seen here). They are made with 100% soft jersey cotton and have 2cm of padding, making them a comfortable surface for babies to play on. I have also put together a Gift Guide for Toddlers and Gift Guide for Parents. Which is your favourite gift from this Gift Guide? How I miss these baby days. I love all of these, especially the keep sake box and those little Inch Blue shoes are so cute! Some really lovely gift ideas here so beautifully curated I really love those gorgeous soft shoes they are adorable! What a lovely gift list! I find shopping for babies so much fun... there’s just so much to buy. I’m loving the grab and go play bag - but I’m thinking of all our Lego at home. This would be so handy. These are lovely gift ideas! My friend is having a baby in the new year so definitely will look at these! This is the first baby gift guide I have ever seen - what a fab idea for a post! I always struggle with what to buy my friends baby! Such a lovely post filled with absolutely beautiful imagery. The personalised box is just simply gorgeous. However I love every single item on your list. Perfect post . Such a luxurious selection. The zebra blanket is the cutest but, bizarrely, there's not a thing I don't like. All of these are so, so sweet! You have given me loads of ideas for my little 3 month old. I love the look of the keepsake box. What lovely gift ideas, I love those cute shoes! Love these ideas.My sister is having a baby in a couple of weeks and I'm loving the keepsake box. These ideas are fab for babies. I love the memory keepsake box. I bought one for my son and kept all his baby things in it. Can't wait to look back on them in years to come. Lovely gifts here. I like the keepsake box and the cute shoes. There are so many wonderful ideas here. I think we got my daughter a keepsake box for her first Christmas!